Forgotten City, 2010. Downtown Minneapolis, fall 2010. Time exposure. This image earned a merit at the PPA International Print Competition, 2011. It was the flour capital of the world around 1880 and beyond. 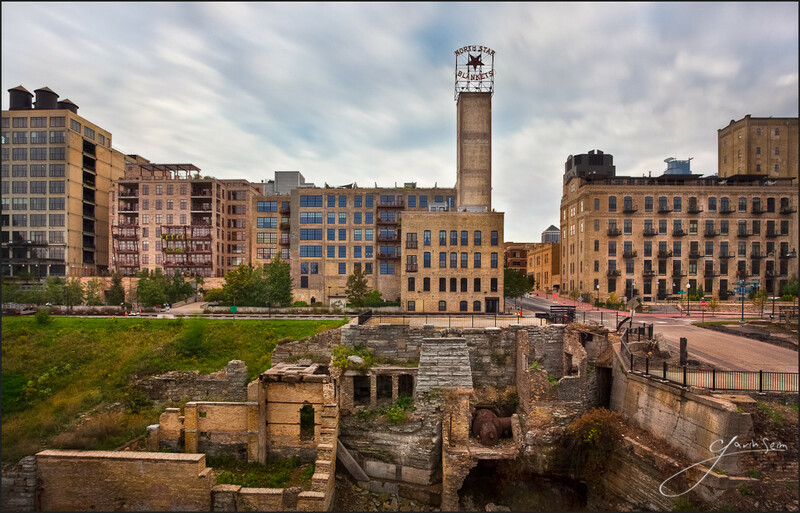 But things change over time and the old flour mill in downtown Minneapolis MN is now a part of the landscape around the Mill City Museum. It’s a pretty neat sight. Remnants of old machinery, underground tunnels and broken structures spark my curiosity and make me marvel at how large the operations here must have been. It’s a mix of the still standing and the now fallen. Both still appreciated. I made this during my tone workshop in mid Sept as we all walked across the bridge and explored the area around the museum and the Guthrey Theater. It was a fun walk and I took home more than one good image from the area. Here I used a very slow shutter to blur the movement of cars and people, leaving the city as a silent piece of history. 5D MK2, 17-40L, 22mm, f16, bracketed 60sec, 20sec, 10sec. The idea here was pretty simple. I had this cool scene in front of me and I wanted it to be clean but bold. To remove the cars, people and downtown activity I used my 10ND filter for a slow shutter speed, as I bracketed for an HDR. The long exposures had the effect of virtually removing the activity and leaving nearly empty streets. At a glance at least. If you look close you can see the streaking activity. In post I processed with Photomatix as an HDR. Not real strong, just enough to get the sky and detail I needed. I then worked starting in LR and finishing in PS. I also blended to some original layers to maintain balance and keep things clean. In particular note the tunnel area to the bottom right. Darks can be a challenge in digital especially HDR. Rather than trying to make them light and get more artifacts, I softly blended to a mid exposure keeping the area in shadow and more unprocessed which helped prevent the blacks from artifacting. Of course I also did my burning and dodging to get the tone and contrast the way I wanted. This entry was posted in color, f164, Fine Art, journal, signature, technique, travel and tagged brick, broken, downtown, f164, flour, mill, Minneapolis, mn, museum, old, sky. Bookmark the permalink. Until I read the post I thought this was taken the eastern bloc.